The smaller of the two Android Wear 2.0 models released by LG and Google is just too crippled to be taken seriously. There are many adjectives you can use to describe the LG Watch Style: Simple. Basic. Modest. Streamlined. Or you can just cut to the chase and call it what it is: Cheap. Not inexpensive, mind you, just cheap. While LG has positioned the Style as a smaller, more affordable alternative of the Sport, the two models couldn’t be more different. With the Sport, at least you’re getting a lot of watch for your money, but the Style cuts way back on the bells and whistles for the sake of fashion. And while it may cost $100 less than its bulky, bulbous big brother, the Style still somehow feels overpriced, despite its fashionable, dinner-party demeanor. When you get your first glimpse at the Style nestled in its plastic tray, there’s no denying that it looks like a watch that should cost $250. A slim stainless steel bezel encircles the 1.2-inch display, and the leather strap adds a touch of sophistication that gives it the look of a classic timepiece. The Style’s leather Mode band is one of its finer qualities. But once you take it out of the box, the illusion begins to fade. At just 46 grams and 10.8mm thick, the Style is substantially lighter and thinner than the Sport. But even with less mass and bulk than last generation’s standard-bearer Huawei Watch, it doesn’t feel like a substantial piece of jewelry. Flipping it around reveals that it doesn’t have a heart rate sensor, a feature you can find in fitness bands half the price. In its place is a flimsy plastic backing, which severely devalues the case. Aluminum or even just a higher-quality polycarbonate would have gone a long way here. That being said, strapping on the Style feels good, especially after you spend a few days breaking in the somewhat stiff leather band. The digital crown sticks out a touch more than I would have liked and the buckle is so thin it feels as though it’ll break with too much force, but overall the Style is comfortable enough to wear every day. 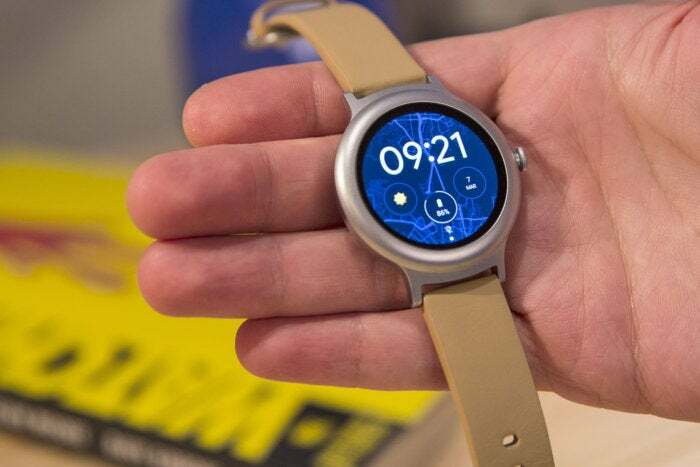 Alerts and notification vibrations were somewhat dull compared to the Sport, and since Android Wear still doesn’t offer a way to increase the intensity, you’ll need to either stay tuned to your wrist or download a third-party app. A Mode pin on the back of the band lets you swap out compatible straps with ease, though any old 18mm spring bar band will fit. And the watch is plain enough that pretty much any color or style of band will look good, though it will pick up dings and scratches on its brushed bezel. The Style was built with LG’s “friends at Google,” but it’s hard to see exactly what the Pixel maker contributed to it. While the Sport is a true showcase for the phone-free features of Android Wear 2.0, the Style functions mostly like last-generation’s wearables, what with its lack of NFC, LTE, or GPS. So you can be assured that you’re going to have to keep your phone around at all times. If you use your Style as more than a passive watch, your battery life will suffer. Perhaps these decisions were made in the interest of battery life. With a 240mAh battery and barely any on-watch functionality, there should be plenty of power to get through a day of notifications, fitness tracking, and light use, but my mileage varied greatly. On days when I treated it like a passive device, glancing at it when alerts came in and checking the time, it easily made it till nighttime. But once I did something relatively strenuous on the watch, like start a workout or download a few apps, there was a noticeable loss of juice. On one particularly heavy usage day it shut down after about 8 hours, but generally it was good for around 12. The watch comes with a magnetic induction charger puck, but you don’t get the cradle that comes with the Sport. That’s not a huge loss, since it’s kind of flimsy anyway, but you’ll need to make sure the watch affixes to it properly. I haphazardly connected it one night and woke up to a watch that hadn’t charged. The entire reason for the Style’s existence is Android Wear 2.0. It was unveiled when Google’s formally launched the new OS, and more than a month later, it and the Sport are still the only watches running it. That’s a plastic back on the Style, which means no heart-rate sensor. And it’s also missing NFC. But Android Wear 2.0’s premier feature isn’t even represented here. Without an NFC chip, the Style can’t take advantage of the new Android Pay functionality, with or without a phone nearby. Payments are a long-awaited feature on Android Wear watches (Apple and Samsung have had them for a long time), so to not have it on one of the two flagship Android Wear 2.0 watches is downright bizarre. Equally odd are its fitness capabilities. With the new Google Fit app, your watch can do much more to track your exercises in Android Wear—count reps, monitor stair climbing, calculate distances traveled on foot or by bike, etc.—but the coolest feature of the Fit app, Strength Training, isn’t available on the Style. While the watch will keep track of your sit-ups, push-ups, and squats, it only does so if you tell it what kind of exercise you’re doing. Strength Training on the Sport automatically recognizes what exercise you’re doing and tracks it, making it an indispensable tool for gym rats, but while the Style technically has the necessary sensors to support it (accelerometer and gyroscope), the option isn’t there. Presumably it’s another battery-fueled decision, but it’s just one more way that the Style is limited. And swimmers should note that it’s also not as water resistant as the Sport (IP67 vs. IP68), so you should probably keep it out of the pool. Android Wear 2.0 is a definite improvement over its predecessor, but it’s far from perfect. While things like messaging and fitness have certainly improved, all throughout the interface are little annoyances that aren’t specific to the Style, but highlight Android Wear’s immaturity. Android Wear 2.0’s app launcher aligns apps in a circular pattern, but options in settings are straight. Why? Navigation has greatly improved, and much of it is due to the new crown that aids in scrolling. While LG certainly owes a debt of gratitude to Apple here, the implementation isn’t quite as good as it is on watchOS. With just one button on the Style, I naturally assumed that pressing it would bring me back a screen until I reached the watch face. I was wrong—while pressing it on the watch screen brings up the app selector, pressing it anywhere else instantly returns you to the watch face. I lost track of how many times I instinctively pressed it to go back a screen, only to have to start whatever process I was doing all over. And when you’re on the watch face, the dial is also confusing. If you spin the dial up you’ll bring up the notification pane, but spinning downward doesn’t lower the quick settings menu (you still need to swipe down). And one other annoyance: While the app selector screen is formatted to hug the contours of the face while you scroll, the other settings screens put their options straight down the middle. Granted, it doesn’t affect the experience all that much, but it serves to create a sense that Google hasn’t paid attention to enough little details to make using Android Wear 2.0 as pleasurable as it should be. Android Wear 2.0 has only just launched and upgrades to other watches aren't yet available, but its two main cheerleaders aren’t doing much to pump up the crowd. On one hand, the Sport does everything, but it’s a behemoth of a watch, and the far-more-svelte Style is so crippled in its functionality you’d probably be better getting a Huawei Watch on clearance. Don’t be fooled by its good looks. The LG Watch Style is not worth the price of admission. The message Google seems to be sending with the Style watch is that it’s a fashion-first accessory that should only be used for the most basic of smartwatch needs. But at $250, the Style isn’t exactly an impulse buy, and for that kind of money, you should at least expect to get NFC and GPS. The Style could get away with its price if it was supremely luxurious, but it just feels too cheap to be taken seriously. If it came in at about $100 less it would be a no-brainer, but there aren’t many gadgets that you couldn’t say that about. Mostly, the Style is a forgettable product that simply misses that mark and doesn’t do anything to move the needle on Android Wear. And Google may be running out of time to find a watch that will. The LG Watch Style has good looks, but it doesn't do nearly enough. Much better looking than its bigger brother. Manages to pack decent battery life into a thin frame. No NFC for mobile payments. No heart-rate sensor or strength training.